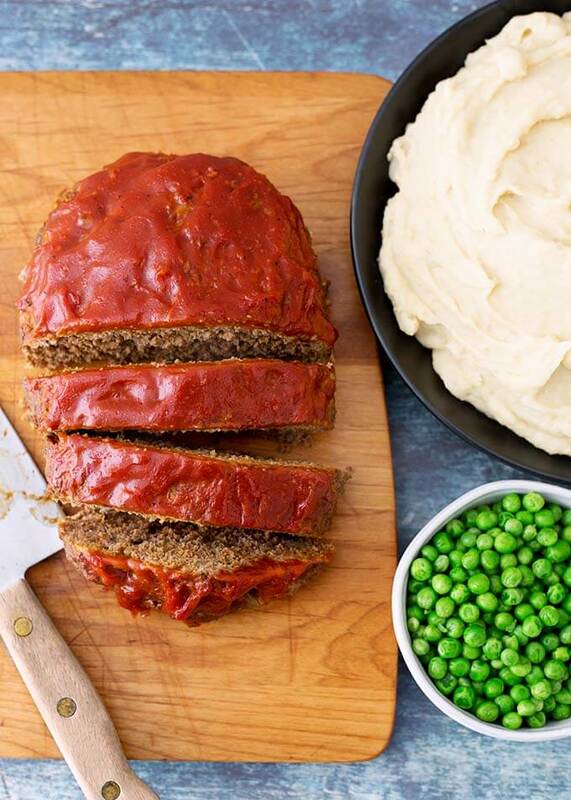 A delicious homestyle dinner, Instant Pot Meatloaf and Mashed Potatoes are cooked at the same time in your electric pressure cooker. This is a convenient meal to make, as it doesn’t call for anything fancy. The flavors are traditional and comforting, and you can adjust it to make it your own. This pressure cooker meatloaf and mashed potatoes dinner is sure to become a favorite meal for your family! A meatloaf isn’t that difficult to make. Throw some stuff in with some ground beef and bake it. How about cooking some potatoes at the same time, and faster? How about being able to get it in the pot and walk away until it’s done? Instant Pot Meatloaf and Mashed Potatoes is that kind of meal. Most families have their own version of meatloaf that they make. There are thousands of variations out there. This Instant Pot Meatloaf recipe is pretty traditional, and tastes really good. A great place to start if you are learning to cook, or if [GASP!] you have never had meatloaf. The typical sidekick to meatloaf is mashed potatoes. For this Instant Pot Meatloaf and Mashed Potatoes recipe, you can cook them at the same time, in the same pot! How great is that? I’ve broken down the steps for you so you can make this yummy dinner with ease. Start with all of your ingredients gathered together, and your potatoes peeled and quartered. Then it’s all about assembling. Not everyone likes to cook. If they did, we probably wouldn’t have so many restaurants around! I truly believe that the Instant Pot® electric pressure cooker has reignited the cooking fire in many home cooks, and even in professionals! I know that it opened up a world of culinary possibilities for me, and I love sharing my recipes with you! I really love hearing from you. Please leave me a comment below and let me know how you liked this recipe. If you have any questions, please ask! I try to answer all questions. Have a great day! Instant Pot Meatloaf and Mashed Potatoes are cooked together in one pot. 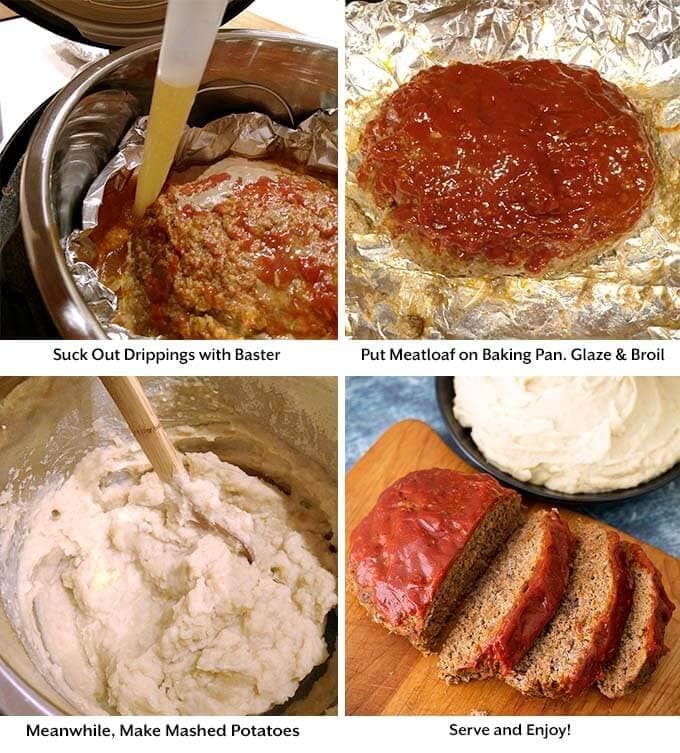 A delicious and easy to make pressure cooker meatloaf and mashed potatoes dinner. 1/2 cup Heavy Cream (or half and half, milk, etc.) As much as you need to get desired creaminess. Put the quartered potatoes in the bottom of the pot. Add the broth and garlic, if using. Set the trivet right on top of the potatoes. Add all of the meatloaf ingredients to a large bowl and use your fingertips to lightly combine thoroughly. Place mixture onto a piece of heavy duty foil and shape the meat into a loaf of even thickness. Try not to make it too a thick. If it's too thick you will need to cook it longer. Fold the sides of the foil up to make a bowl shape (this will collect the drippings). Lift the meatloaf in the foil bowl into the pot and set on the trivet. Make sure there is a little room around it for the steam to circulate. Place the lid on the pot and set the steam release knob to the Sealing position. Then press the Pressure Cook/Manual button, or dial and then the + or - button or dial to select 30 minutes. 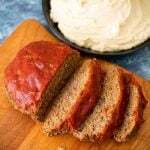 While the meatloaf and potatoes are cooking, mix up the topping by adding the ketchup, BBQ sauce, mustard, and brown sugar, if using, in a bowl. Set aside. When the cook cycle ends, turn off the pot and let it sit for 10 minutes (10 minute natural release). Then turn the steam release knob to the Venting position and do a Quick Release of the remaining steam. 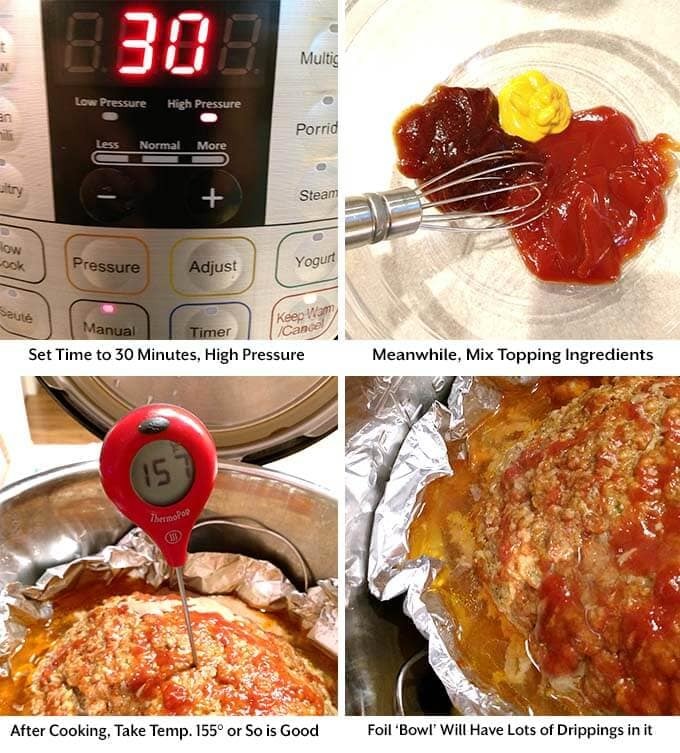 When the pin in the lid drops down, open it and get a meat thermometer and take the temperature of the meatloaf. Beef should be 160°, turkey should be 165°. If it isn't done, put the lid back on and set time for another 10 minutes and cook it longer (I have never had this happen, but people may put in different ingredients, or may be at a higher altitude, which will affect cooking time). Get a turkey baster and a baking sheet pan. Use the turkey baster to suction out most of the drippings so that when you lift the meatloaf out of the pot, hot drippings won't spill on you. Just put them in a coffee cup or a bowl. Lift the foil with the meatloaf on it out of the pot and onto the baking sheet pan. Spread the topping on the meatloaf and put under the broiler at 425° until it's caramelized to your liking. While the meatloaf is broiling, add the butter and salt to the potatoes, still in the pot, and stir/mash. Don't forget about your meatloaf under the broiler! Check on it so it doesn't burn. Add as much heavy cream/milk as you wish, and sour cream, if using. Taste and adjust salt, if necessary. After you remove the meatloaf from the oven, let it rest a minute while you get the meal served. Enjoy! Made this tonight for dinner and the whole family loved it. The meatloaf was tasty, I added some chopped mushrooms that had to be used up. The mashed potatoes were so creamy and perfect. I didn’t add the garlic. Thanks for the recipe! That’s great, Judy! I’m so glad that you and your family enjoyed the meatloaf and mashed potatoes! Thank you for your review! Hi! Sounds delicious and I want to try this. I’ve made meatloaf in my 6qt IP with a pyrex insert but have never been able to fit potatoes too. When reading this it seems like without draining the liquid from the potatoes they might be really wet. Do you drain the liquid/broth off the potatoes before mash them? Thank you! I’m so pleased I found your blog! Actually, they sometimes aren’t wet enough. If they are too wet, you can always drain out some of the liquid before mashing. Do you only allow the 5 star reviews to appear on the site? No Jason, however, if I get a review that is low star rating, and I don’t have the information as to what the individual did that made the recipe not turn out, say a drastic difference than what everyone else is getting, I won’t put it up without that information. I need a negative review to be constructive and helpful to the other people who may want to make it. I find that often is was something the person did, or maybe something I neglected to put in the instructions or ingredients. If that is the case, I would add or change it and note that I did so, if applicable. If I ask the person what they did, I may not hear back from them. It hasn’t happened but a couple of times. I had someone give one of my recipes a bad rating, and it turned out they used all of the liquid in the canned beans, and I had clearly written to drain them. So, I appreciate feedback, but need to know what the person did that made it turn out differently. I do get a lot of 5 star ratings. They have only been active since Winter as a setting on my site was not allowing ANY comments to get through. Made this tonight and it was really good. My family all had seconds. Made this tonight and it came out perfect! I like that the foil bowl caught the meatloaf drippings and none of it got down to the potatoes. We will make this a regular meal at our house! Thank you for your review, Debbie! I’m glad you liked it! I am making this right now for dinner. Thanks for the pics and well explained directions. This is dish number 2 for dinner and overall the 4th thing I have made. That’s great! I hope you liked it! We have made this recipe a dozen times. It is ourwas our first instant pot recipe And has becorme a favorite. We both Leave potatoes whole with fingerlings or little reds or make mashed if we are cutting them up anyway. Thankful to be able to Substitute venison. (We usually use 50-50 ground venison to sausage) good with ketchup or BBQ sauce. Try it however you like, it will become a family favorite! Hi Sean, wow does your version sound tasty! I miss having venison.Thank you for your review! I am wanting to try this. Would the cook time change if I wanted to skip the potatoes? Would it also make a difference say if I used a round aluminum pan instead of using the tin foil? Hi Werra. No, the cook time will stay the same without potatoes. You can use a pan, though it may require a few extra minutes. For the first time, I would try it at the time in the recipe. You can always pop it back in for a few minutes if you need to. I highly suggest a meat thermometer. Just my husband and myself so if I half the ingredients will I still cook the 30 minutes? No, if the meatloaf is smaller, I would try 20 minutes first. I loved the recipe! It was delicious. My whole preparation time (from start to serving) was 1 hour 45 minutes. I added 2 tbsp of brown sugar to the glaze because I like it sweeter ;). Next time I will try to cook the potatoes in only water and salt since my picky eaters said that the potatoes didn’t taste as usual. Overall, great recipe, but will tweak a few things for my picky eaters! Hi Larry! Yes, if you will be making a smaller meatloaf you will want to decrease the cook time as the loaf will not be as thick. If you cut the recipe in half, start with 20 minutes, high pressure, and a 15 minute natural release. It may come out a little underdone, but you can add time based on that baseline. That way it won’t be overcooked. I have made this twice now and LOVE it! 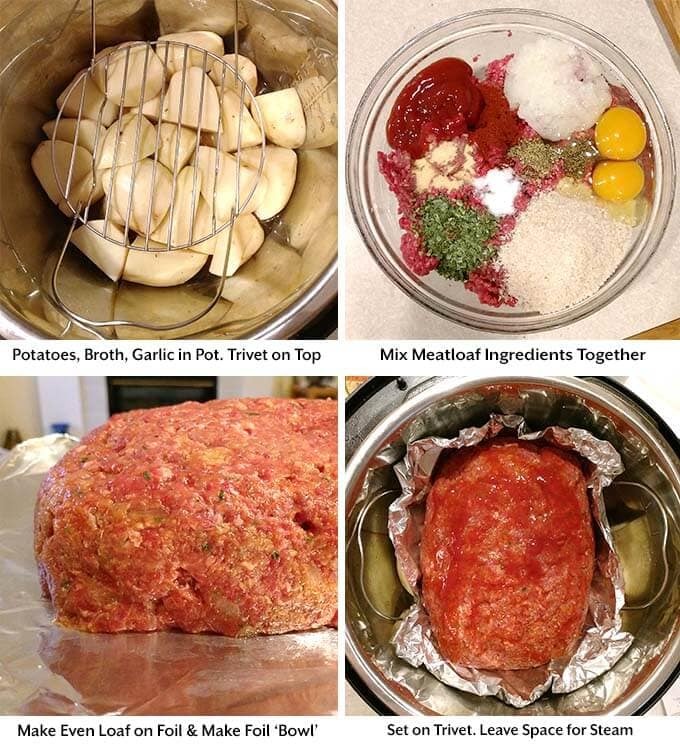 I make a 3 pound meatloaf (love leftovers for meatloaf sandwiches) in a circular shape in my 8 quart and cook for 27 minutes with QR and it was amazing both times! Excited to try this as my first recipe in my new Instant Pot. Would I need to adjust the cooking time if I use sweet potatoes instead of regular potatoes? Awesome! As long as you cut the potatoes into chunks, they will be super soft for mashing. If you don’t want them as soft, cut the chunks large. Please let me know how it turned out! I had never made meatloaf myself even though I almost always enjoy it when I have it. I decided it was time to change that after seeing this recipe. It ended up exactly as I hoped it would. The potatoes were also very tasty and having it all cooking at once was awesome. I used regular paprika and parsley instead of chives because it was what I had on hand. I also decided to leave off the brown sugar since I was using BBQ that already had brown sugar in it. I just wish my wife liked meatloaf so I could make this one more often. That’s so great, Joan! Thank you for your review, I’m so happy you and your guys liked this recipe! I like to cook the potatoes whole with the skin on. I hate peeling potatoes. Make a cut with a knife around the center and after cooking it slides right off. Yes you would have to take them out of pot to remove peels and then put back in to mash. Yes, the size of the potatoes does affect the cook time. See my Instant Pot Baked Potatoes post for the times I use. My meatloaf was too wet??? Sorry to hear that. Did you try broiling it after pressure cooking? That would help, I think. I can’t say why this happened as I don’t know how closely you followed my recipe. You can add more bread crumbs and/or reduce the milk, though there is only 1/3 cup in there. If it was from the condensation of the pot, maybe try tenting foil loosely over the top before pressure cooking. Great recipe! It halves perfectly for the 3qt Instant pot too! Thank you, Katie! That little 3 qt pot is so fun to use! Glad this recipe worked for you! If I use 1.5 pounds of ground beef instead of 2 pounds will the cooking time change? You can try 25 minutes. We had this for dinner tonight. The meatloaf was delicious. Mine fell apart at but…maybe I should have added more bread crumbs. The flavor was very good anyway. The glaze was a bit sweet but nice. The potatoes however turned out gummy. I did measure everything exactly so I don’t know what went wrong. Certainly tastes good though. I feel like 3 pounds of potatoes is a bit much for the amount of meat. I’ll absolutely make this again and again but will make a couple of adjustments. Is it possible to substitute Worcester sauce instead of bbq sause? I would use it sparingly, but yes! This looks delicious and I am looking forward to making it tonight in my IP. This is my first time making meatloaf. I do not have a turkey baster, is there anything else I can do/use to remove the drippings? You can use a small ladle or spoon, it will take a little longer. Just be careful as it will be very hot! This is the best meatloaf I have ever made and eaten! I actually ate the leftovers and I never eat leftover meatloaf. The only thing I did different was use 1lb of ground pork and 1lb of lean ground beef and it was delicious! Will definitely be making this recipe regularly! Made this tonight and OMG! I used jalapeño honey bbq sauce in the meat and raspberry chipotle bbq sauce with the ketchup and mustard sauce on top….amazing! Both bbq sauces are from Galena, IL. Best meal I have made in my IP so far. Thank you! we love our instant pot and your recipes have really been awesome! The meatloaf and mashed potato recipe turned out amazingly delicious! Don’t think I’llever go back to using the oven for meatloaf again! I highly recommend this and all your recipe to all instant pot users! Thank you! That’s great, Robyn! I’m so happy you enjoyed the meatloaf recipe. Thank you for your review! This was SO good! I did drain my potatoes and used milk and butter to whip them with an electric hand mixer. Best meatloaf ever! That’s great, Carol! Thank you for your review!